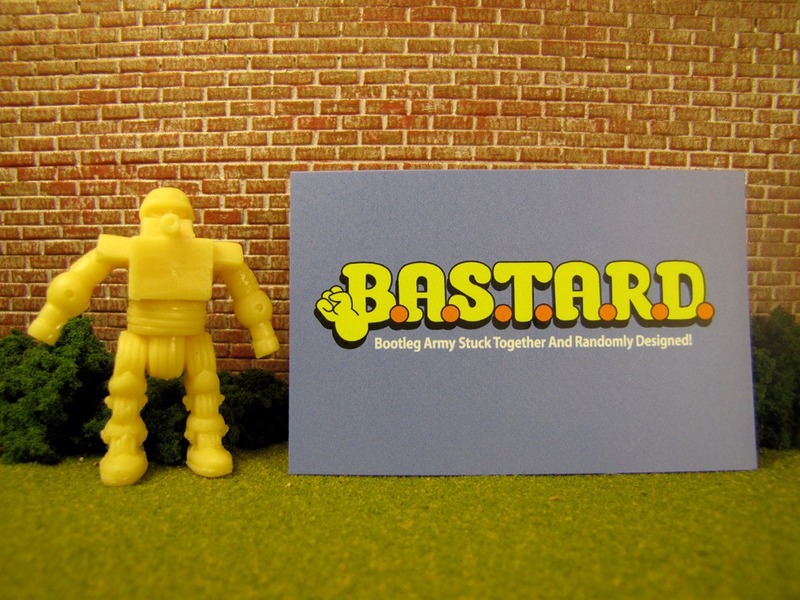 Triclops Studio created a line of custom figures called B.A.S.T.A.R.D. (Bootleg Army Stuck Together And Randomly Designed). The line consist of five different figures: Tommy Tanker, Ballock, Musclito, Peenut, and Peenut Hunter. This spotlight will focus solely on Tommy Tanker. 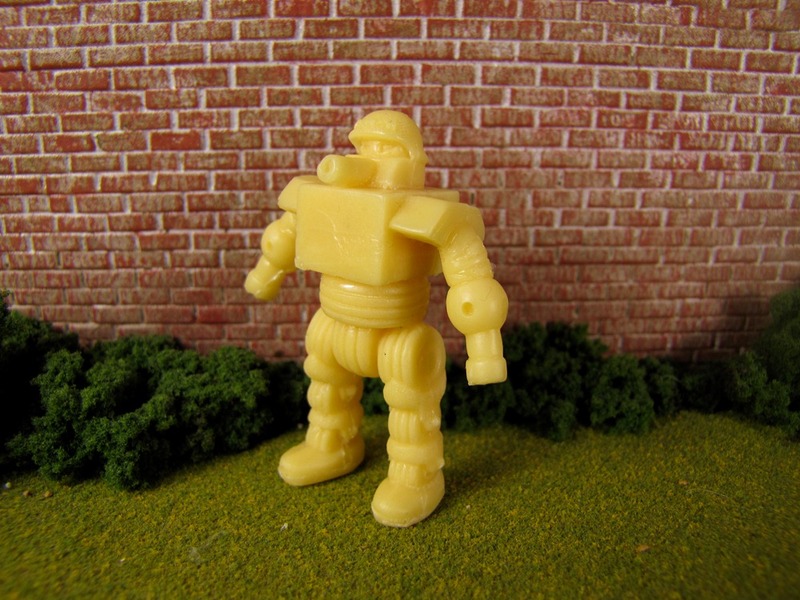 Astute M.U.S.C.L.E. collectors will instantly recognize that Tommy Tanker is mainly constructed from two M.U.S.C.L.E. figures – the head and arms from #121 and the bottom-half of the #95 figure. Even though the source figures are easily identifiable, the end product feels incredibly unique. The key element in that transformation is the cube chest piece. This addition shifts the figure from a kit-bashed figure to a fully realized character. The head of #121, joined with the other pieces, now evokes a real war-machine esthetic. This transformation is truly amazing given that #95 and #121 in their original states do not create that impression. Instead those figures have a silly and incompetent quality to them. The B.A.S.T.A.R.D. 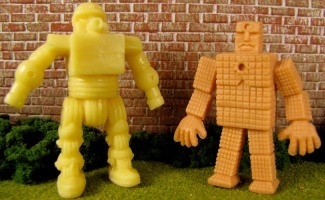 figures draw great inspiration from the M.U.S.C.L.E. 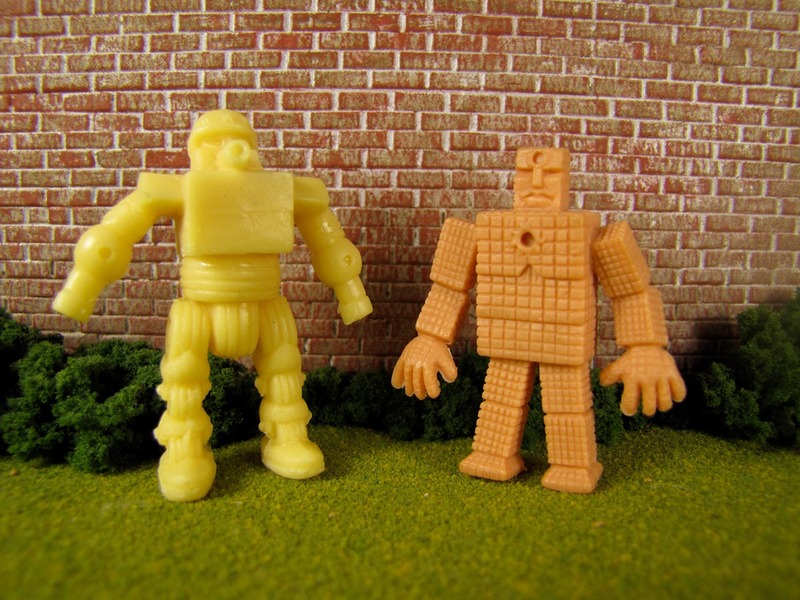 brand and Tommy Tanker could have easily been an original M.U.S.C.L.E. figure. The most unique quality of the figure is that he is most visually attractive from a slight angle. For some collectors this could be viewed as a negative attribute. 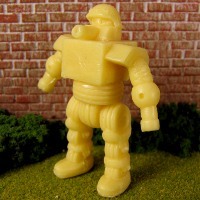 Hopefully that is not the case, because this unique trait only further adds to the figure’s charm and connection the original M.U.S.C.L.E. brand. Having to force a collector to decide on the “best” way to view it is similar to the #219 or #229 figures. The B.A.S.T.A.R.D. figures were cast in many different colors, this Tommy Tanker was cat in a dull yellow/cream color. Given the overall quality of this figure it would likely be attractive in any color. A dark, military green would probably best suit this specific figure. Tommy Tanker and all the B.A.S.T.A.R.D. figures were cast in resin. Some collectors have grown tired of resin or simply dislike resin in general. 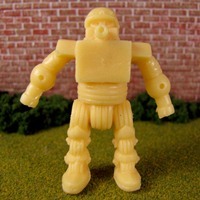 While those collectors are entitled to their opinion, Tommy Tanker is not any less enjoyable cast in resin. 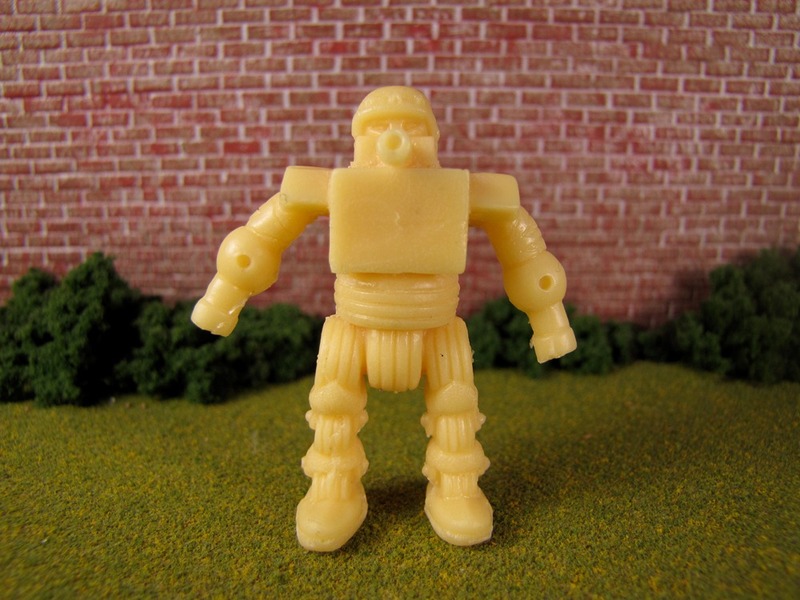 In fact, this helps to keep the cost down (only $8 per figure) – which probably explains why the B.A.S.T.A.R.D. figures have already sold out . Cynics might say, “Of course UofM likes these figures. Anything M.U.S.C.L.E.-related will be viewed favorably.” There may be a grain of truth there, but this time the University of M.U.S.C.L.E. isn’t the only on recognizing these great toys. The B.A.S.T.A.R.D. figures and Triclops Studio were nominated for Best Mini Series and Best Self Produced. The original run of B.A.S.T.A.R.D. figures may have already sold-out. But collectors should keep their eyes open and be ready to add the B.A.S.T.A.R.D. figures to their always growing collections. This entry was posted on Tuesday, July 3rd, 2012 and is filed under Art, UofM News. You can follow any responses to this entry through RSS 2.0. You can skip to the end and leave a response. Pinging is currently not allowed.